Vazirian, M., Alehabib, S., Jamalifar, H., Fazeli, M., Najarian Toosi, A., Khanavi, M. (2015). Antimicrobial effect of cinnamon (Cinnamomum verum J. Presl) bark essential oil in cream-filled cakes and pastries. Research Journal of Pharmacognosy, 2(4), 11-16. M. Vazirian; S. Alehabib; H. Jamalifar; M. R. Fazeli; A. Najarian Toosi; M. Khanavi. "Antimicrobial effect of cinnamon (Cinnamomum verum J. Presl) bark essential oil in cream-filled cakes and pastries". Research Journal of Pharmacognosy, 2, 4, 2015, 11-16. Vazirian, M., Alehabib, S., Jamalifar, H., Fazeli, M., Najarian Toosi, A., Khanavi, M. (2015). 'Antimicrobial effect of cinnamon (Cinnamomum verum J. Presl) bark essential oil in cream-filled cakes and pastries', Research Journal of Pharmacognosy, 2(4), pp. 11-16. Vazirian, M., Alehabib, S., Jamalifar, H., Fazeli, M., Najarian Toosi, A., Khanavi, M. Antimicrobial effect of cinnamon (Cinnamomum verum J. Presl) bark essential oil in cream-filled cakes and pastries. 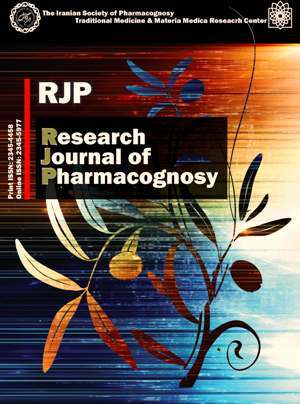 Research Journal of Pharmacognosy, 2015; 2(4): 11-16. 1Department of Pharmacognosy, Faculty of Pharmacy and Medicinal Plants Research Center, Tehran University of Medical Sciences, Tehran, Iran, 14155-6451. Background and objectives: Food poisoning has been always a major concern in health system of every community and cream-ﬁlled products are one of the most widespread food poisoning causes in humans. In present study, we examined the preservative effect of the cinnamon oil in cream-filled cakes. Methods: Antimicrobial activity of Cinnamomum verum J. Presl (Cinnamon) bark essential oil was examined against five food-borne pathogens (Staphylococcus aureus, Escherichia coli, Candida albicans, Bacillus cereus and Salmonella typhimurium) to investigate its potential for use as a natural preservative in cream-ﬁlled baked goods. Chemical constituents of the oil were determined by gas chromatography/mass spectrometry. For evaluation of preservative sufficiency of the oil, pathogens were added to cream-ﬁlled cakes manually and 1 μL/mL of the essential oil was added to all samples except the blank. Results: Chemical constituents of the oil were determined by gas chromatography/mass spectrometry and twenty five components were identiﬁed where cinnamaldehyde (79.73%), linalool (4.08%), cinnamaldehyde para-methoxy (2.66%), eugenol (2.37%) and trans-caryophyllene (2.05%) were the major constituents. Cinnamon essential oil showed strong antimicrobial activity against selected pathogens in vitro and the minimum inhibitory concentration values against all tested microorganisms were determined as 0.5 μL/disc except for S. aureus for which, the oil was not effective in tested concentrations. After baking, no observable microorganism was observed in all susceptible microorganisms count in 72h stored samples. Conclusion: It was concluded that by analysing the sensory quality of the preserved food, cinnamon oil may be considered as a natural preservative in food industry, especially for cream-filled cakes and pastries. Vazirian M, Kashani ST, Shams Ardekani MR, Khanavi M, Jamalifar H, Fazeli MR, Najarian Toosi A.Antimicrobial activity of lemongrass (Cymbopogon citratus (DC) Stapf.) essential oil against food-borne pathogens added to cream-filled cakes and pastries. J Essent Oil Res. 2012; 24(6): 579-582. Benchaar C, Calsamiglia S, Chaves AV, Fraser GR, Colombatto D, McAllister TA, Beauchemin KA. A review of plant-derived essential oils in ruminant nutrition and production. Anim Feed Sci Tech. 2008; 145: 209-228. Mortiz CMF, Rall VLM, Saeki MJ, Junior AF. Assessment of antimicrobial activity of cinnamon (Cinnamomum zeylanicum) essential oil combined with EDTA and polyethylene glycol in yogurt. Acta Scientiarum. 2015; 37(1): 99-104. Fei LU, Yi-cheng D, Xing-qian YE, Yu-ting D. Antibacterial effect of cinnamon oil combined with thyme or clove oil. Agri Sci China. 2011; 10(9): 1482-1487. Moarefian M, Barzegar M, Sattari M. Cinnamomum zeylanicum essential oil as a natural antioxidant and antibacterial in cooked sausage. J Food Biochem. 2013; 37: 62-69. Sfeir J, Lefrancois C, Baudoux D, Derbre S, Licznar P. In vitro antibacterial activity of essential oils against Streptococcus pyogenes. Evid-Based Compl Alt. 2013; 2013: 269161. Tiziana Baratta M, Bamien Dorman HJ, Deans G, Cristina Figueiredo A, Barroso G, Ruberto G. Antimicrobial and antioxidant properties of some commercial essential oils. Flavour FragJ. 1998; 13: 235-244. Usha M, Ragini S, Naqvi SMA. Antibacterial activity of acetone and ethanol extracts of cinnamon (Cinnamomum zeylanicum) and ajowan (Trachyspermum ammi) on four food spoilage bacteria. Int Res J Biological Sci. 2012; 1(4): 7-11. Barceloux DG. Cinnamon (Cinnamomum species). Dis Mon. 2009; 55(6): 327-335. Adams RP. Identification of essential oil components by Gas Chromatography/Mass Spectroscopy. 4th ed. Carol Stream: Allured Publishing Co., 2007. Davies NW. Gas chromatographic retention indices of monoterpenes and sesquiterpenes on methyl silicone and Carbowax 20M phases. J Chromatogr. 1990; 503: 1-24. Högnadóttir Á, Rouseff RL. Identification of aroma active compounds in orange essence oil using gas chromatography–olfactometry and gas chromatography–mass spectrometry. J Chromatogr A. 2003; 998: 201-211. Priestap HA, Van Baren CM, Lira PDL, Coussio JD, Bandoni AL. Volatile constituents of Aristolochia argentina. Phytochemistry. 2003; 63: 221-225. Goni P, Lopez P, Sanchez C, Gomez-Lus R, Becerril R, Nerin C. Antimicrobial activity in the vapour phase of a combination of cinnamon and clove essential oils. Food Chem. 2009; 116: 982-989. Tzortzakis G. Impact of cinnamon oil - enrichment on microbial spoilage of fresh produce. Inn Food Sci Emerg Technol. 2009; 10: 97-102. Ojagh SM, Rezaei M, Razavi SH. Improvement of the storage quality of frozen rainbow trout by chitosan coating incorporated with cinnamon oil. J Aquat Food Prod T. 2013; 23(2): 146-154. Lopes FA, Soares NFF, Pires Lopes CC, Silva WA, Júnior JCB, Medeiros EAA. Conservation of bakery products through cinnamaldehyde antimicrobial films. Packag Technol Sci. 2014; 27(4): 293-302. Oliveira MM, Brugnera DF, Nascimento JA, Batista NN, Piccoli RH. Cinnamon essential oil and cinnamaldehyde in the control of bacterial biofilms formed on stainless steel surfaces. Eur Food Res Technol. 2012; 234: 821-832. Jo YJ, Chun JY, Kwon YJ, Min SG, Hong GPP, Choi MJ. Physical and antimicrobial properties of trans-cinnamaldehyde nanoemulsions in water melon juice, LWT - Food Sci Technol. 2015; 60(1): 444-451. Gutierrez J, Barry-Ryan C, Bourke P. The antimicrobial efficacy of plant essential oil combinations and interactions with food ingredients. Int J Food Microbiol. 2008; 124: 91-97. Gutierrez J, Barry-Ryan C, Bourke P. Antimicrobial activity of plant essential oils using food model media: efficacy, synergistic potential and interactions with food components. Food Microbiol. 2009; 26: 142-150.